Donald W. Washkewicz, Chairman and CEO of Parker Hannifin at the opening of the company’s Polymer Innovation Center. Parker Hannifin Corp. celebrated the grand opening today of its newly named Donald E. Washkewicz Polymer Innovation Center in Ravenna, Ohio, a new research lab on the grounds of its Parflex hose and tubing division’s headquarters. The Parflex Division designs and manufactures thermoplastic and fluoropolymer hose, tubing and accessories for transportation, medical/life sciences, oil and gas, construction, and marine. The new research lab will create more than 30 jobs, and is designed to provide innovative solutions for polymer and materials development for its hydraulic and process hose and the medical/life science industries in partnership with the Cleveland Clinic and University of Akron. According to Parflex division product engineering manager William C. Fisher, the new materials will help Parker to design hose and tubing products that can withstand higher temperatures and pressures or more flexing. The Polymer Innovation Center is a 24,000 square foot facility within the Parflex headquarters that consolidates the division’s research and development activities into one location. It will also be used to pilot and prototype innovative new products. It was made possible through a $2.3 million funding commitment from Ohio’s Third Frontier Research and Development Center Program and a $15 million investment from Parker. The University of Akron and the Cleveland Clinic Foundation have collaborated with Parflex on the project. The center is expected to create 34 high-technology and engineering jobs. The facility currently employs more than 300. According to Mark Gagnon, general manager of the Parflex division, about 40% of the focus at the new facility will be on materials used in medical devices. This will be its fastest growing area. The majority of business will still come from its traditional markets in fluid power segments such as oil and gas, material handling, mobile machinery, and more. Parker’s new Polymer Innovation Center features a variety of mobile extrusion machines. Washkewicz added that when the Parflex division was started, Parker was dead last in the industry in terms of hydraulic hose sales. Now, he said, the company offers the largest and broadest line of hydraulic hose and tubing products in the world, with a billion dollars in sales. The Polymer Innovation Center is charged with creating, testing and proving innovative new materials and products for use across a wide spectrum of industries, including a focus on medical polymers through its collaboration with the University of Akron and the Cleveland Clinic Foundation. The facility includes a support lab, processing area, plus offices and conference space. A state-of-the-art cleanroom will allow Parker to design and develop innovative new medical devices. A short tour included details about the Innovation Center’s Class 10,000 ISO 7 clean room; its process lab for process development, mockups and testing of materials; and a look at its extrusion machinery, which are designed to be mobile. The facility includes a variety of unique extrusion machines in its compound mixing room, to allow Parker to develop its own plastics instead of trying to customize an already existing design. One includes a three-layer extrusion line that can extrude three materials and bond them together; a silicone/rubber extruder that can be used vertically or horizontally, and a 90-ft, five-story polytetrafluoroethylene (PTFE) paste tower for medical tubing development. Because of the collaboration with the Cleveland Clinic, the Parflex division will serve as a rapid prototyping center, shaving weeks and months off of product development. What once could take four to five months can now take two to three weeks. 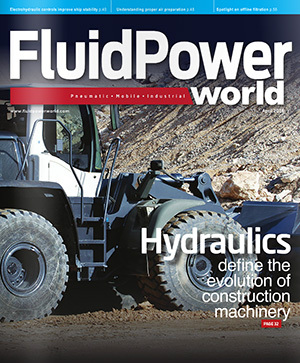 Browse the most current issue of Fluid Power World and back issues in an easy to use high quality format. Bookmark, share and interact with the leading design engineering magazine today.